Farmed animals are the most abused animals on the planet and are subjected to horrible cruelties, including extreme confinement and mutilations without painkillers. Fortunately, one of the best things we can do to reduce and prevent their suffering is to eat vegan foods. There are tons of ways that people make the switch to a vegan diet, and no single way is perfect for everyone. Follow these tips and you’ll be eating vegan in no time! • Start incorporating new foods. For most people, eating vegan expands their palates and opens up a whole new world of foods they might never have tried otherwise. There are some unfamiliar foods like nutritional yeast (aka nooch), seitan, and tempeh that you should definitely try. As you find new plant-based foods you like, you can start removing some animal-based ones. Taking part in Meatless Monday is a great way to practice eating vegetarian one day a week. It’s a small change, and it can help you stay on track while trying new foods. Once you get the hang of it, you can add more meatless days each week! • Find meat and dairy alternatives you love. There are vegan versions of nearly all your favorite foods. From veggie sausages and burgers to plant-based mayo and cheese, new vegan substitutes for meat and dairy products are hitting store shelves all the time. A great way to start using these products is to add them to your favorite recipes in place of their animal-based counterparts. • Cut out the most suffering. Start by cutting out the foods that harm the most animals. Ninety-five percent of the animals we eat are chickens and fish—and they are probably the most abused animals in the world. By replacing chicken, eggs, and fish with other options, you can prevent a tremendous amount of animal abuse. • Find vegan food near you. Almost every city in the U.S. has incredible all-vegan restaurants or restaurants that can create fantastic vegan dishes. I mean, even popular chain restaurants and big pizza chains have vegan options nowadays, so find some tasty veg food at restaurants in your area. If you do decide to cut out meat all at once, just remember that none of us is perfect. If you find yourself cheating once in a while, don’t beat yourself up. You can always start fresh at your next meal. Having an approach you can stick with is more important than being perfect from day one. Eating vegan is one of the best ways to prevent animal suffering. You’ll be so much happier knowing that you are contributing to a kinder, more compassionate world. 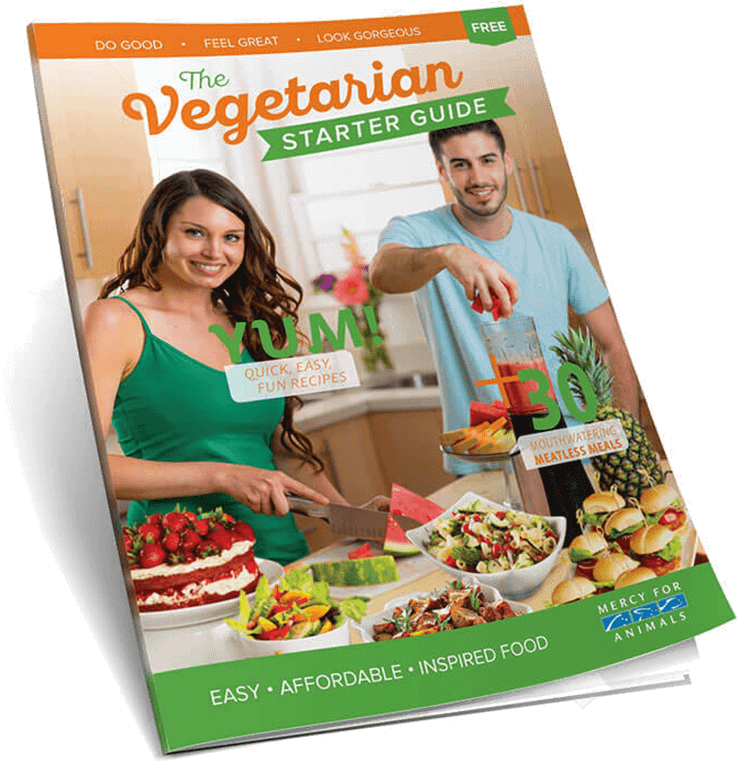 For easy meal ideas, recipes, and more tips on making the switch, order a FREE Vegetarian Starter Guide here.